Shelley Bean: Kids Just Want to Have Fun...And it ROCKS! And here is the fun little video we created to share with you! Here are the finished rocks. and come back here and leave a 2nd comment that you did! And here is the blog candy available! Now be sure to hop on over to Tammy to continue on with our hop! What a great idea! off the beaten path and I like it :) Thanks for such great insperation all of the time. 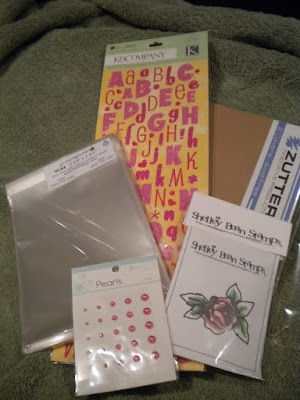 On to the next blog, its so fun! I remember taking my kids for walks - and they would always pick up rocks... Then we would come home with a pocket full of rocks to look at. Great idea - good for your son to create a blog too! I love this project! I'm going to try it with my granddaughter. I've been a follower for awhile. What a cute little idea! These would make nice little paper weights that could be given as teacher gifts! I like this project. I am always at a lost for things and I can totally do this one. my boys would love to do this. we went camping last week and made pet rocks. that was a hit. this would be a BIG hit. thanks for the idea. What a fun project. I will be doing this with my niece and nephews. Thanks for the idea. I LOVE this! Reina is always wanting me to buy those little colored stones from the dollar store and she loves to play with the ones Grandma has as decoration around her house! Thanks for sharing! love this project! new follower here! what a great project to do with kids!!! TFS! Never tried this before, but I will give it a try. Thank you. Love this idea, going out ot find some Rocks!!! LOL!!! I would so love to be able to purchase some stamps, but my budget will not allow it right now, but will keep your site in mind for next week. Thanks. What a GREAT idea My son would LOVE to do this he likes collecting rocks. THanks for sharing. this is so adorable. thanks for sharing. What a fun project for kids. I have way too many of those dollar store glass stones, so might be trying this.Thanks for sharing. Cool idea, Im going to try it w silicone glue! Thanks for the inspiration! My daughter will love this. She is always finding pretty rocks and now she can do something with them. Ha! Thinking outside the paper stack...interesting idea. Thank you for sharing your project and being part of the hop. That is so cool to hold papers!!! It came out so cute!! I am a new follower. Going to check out Trey's bog also. Cool idea, love your website, thank you for the chance to win! I like this idea. pretty classy! any mom or dad would be proud to have them on their desk at work! my daughter would love to do this! it would be a great sentiment in my garden. Absolutely wonderful and your sons blog is great too. He needs have a follow me button! What a cute and inexpensive idea that kids will love! Thanks for the chance to win! Shelley, That is a very creative project, it could be used for several things like paper weight, decoration, in an aquarium. I am a follower and would love to win since it is my B-Day on 9-13. Thanks for such a cute idea. I LOVE LOVE LOVE your projects!! My boys LOVE making these! GREAT Job! what a cute and neat idea!! it sure would keep my 3 boys busy and they could always look at what beautiful art they made! thanks for sharing! Love how you jumped out of the box! Decorating rocks has kept my kids busy for many hours. Great project. have become a follower. Loved your rock-in video :) Sorry had to say it! LOL! Cool idea! I love it (as a former rock collector in grade school)! What a creative project! TFS! How creative! Love it! TFS and inspiring!! Great idea and project to do with kids!! Thank you for sharing! I think this is great! So many different ideas! this is right up my daughters alley, infact I think I still have the 10 boxes of rocks she has been collecting since she could pick them up. Time to empty out the boxes and make some of these! Thanks for the wonderful Idea! Thank you so much for sharing such a fun and easy project! I know my son would love to do something like this! Thank you for sharing! What a great project. The colors you chose are relaxing. Thanks for sharing. I have two boys that will just LOVE this project... I am always finding little pebbles in their pockets that would be wonderful added to the big rocks!! My boys would love to do this project! We've pulled some perfect sized rocks from our garden recently. TFS and I am now a follower. 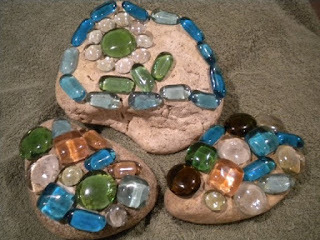 I love the idea of decorating rocks - I'll have to try this out! This is a great project for the kids! Thanks for sharing! Love this project,thanks for sharing and a chance to win..
sorry I am unable to purchase anything right now, but I did ck out the store, I hope to purchase something soon. Already a follower. Love the rocks. Clever idea. Thanks for sharing. Cute idea! My daughter would love to do a project like that! This project rocks! Glue pretty shiny things and rocks! What a fun craft for any occasion.Thanks for sharing. P.S. I am now a follower I can not believe your blog has slipped by me in the past. I am a follower and I love this idea...thanks for the chance to win. What a fun project. I love seeing kids get involved. What a great learning experience for your son! Great blog candy as well. What a great idea for a father's day or mother's day present. Love this idea. I have made those with my girls when they were little. They are fun to do. What a cute idea...and your son is so creative and well-spoken! Thanks so much for sharing...wish I had little ones I could decorate rocks with, but they're grown and gone! what a cute idea. I will definately try this with my grandkids. what a very cute idea. thanks for sharing and for the chance to win. I really loved your project. The reason is I am a Children's Dir. at my local church and I love this idea as a gift for mom or dad. I was thinking it could even be a paper weight. Thank You so much for sharing this idea. I'm a follower and will be checking back often. Terrific idea for keeping the kids busy and so pretty! Very creative! Just became a follower. New follower here:) This is a really cute idea and would work so nicely in a garden. We are just getting ready to put in a small water feature in a flower bed in the back yard..might have to make a few of these for fun. Thanks for the opportunity to view your blog! Love the ideas. Look forward to following you! I love this project! These would look so pretty in a garden. I'm going to do this project with my kids and make "rocks" for grandma's garden. Thanks for sharing! That is such a fabulous project! My kids would have a blast making it :) TFS! Great project! You and your son are so cute in your video. Love this idea! My girls make a stepping stone each year for my husband on Father's Day and I think this would be a great addition to those stones in our garden! Thanks for the inspiration... I am already a follower! Love your project! I teach kinder and this is going to be a great Mother's or Father's day gift idea! TFS!! Following you now, can't wait o see what other great creations you have.